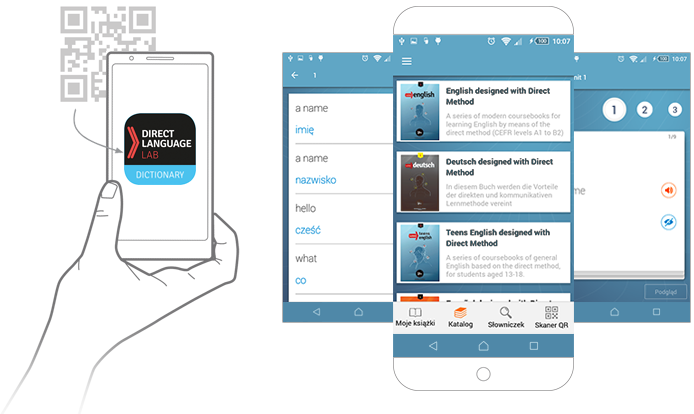 The application Dictionary has been designed for students attending language courses based on the Direct Language Lab coursebooks. The application is a convenient, interactive dictionary with the vocabulary arranged according to the coursebook. It contains all the words from the book. Dictionary enables users to listen to the pronunciation of each word. The pronunciation was recorded for the purpose of this application by native speakers. The translations are hidden by default so that students can try and check if they remember the meanings of the words. The application enables users to easily and intuitively hide and unhide the meanings.